What will cause Israel to dwell in safety, unsuspecting of a Russian attack? Vic Batista: Ezekiel 38:14 reads, "Therefore, son of man, prophesy and say to Gog, 'Thus says the Lord God: "On that day when My people Israel dwell safely, will you not know it?"'" You touched on Israel dwelling in safety in an earlier segment. We believe we can see clues of the Gog and Magog War happening before the Tribulation because there will be a time when Israel will fully be at peace when a covenant is signed between Israel and the Antichrist. Nathan Jones: Could be. The idea that Israel is living at a time of peace it is believed could be due to another war that should happen as a prerequisite to this war. Psalm 83 lists the exact nations bordering around Israel that are missing from the Gog and Magog War interestingly. That gives us the theory that Israel through their own defense forces subdues the surrounding nations. That means that Israel will finally deal with the terrorists coming out of Gaza, Lebanon, Jordan, Syria and Egypt. They will finally have subjugated these countries and can finally live in peace. 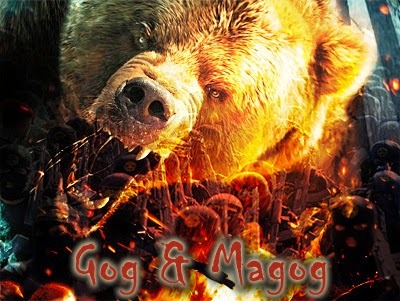 Many people who study Bible prophecy are starting to believe that there must be a Psalm 83 War that happens as a prerequisite to the Gog and Magog War. If Russia said it was leading an overwhelming force against Israel, you can be sure that Hezbollah in Lebanon, and Hamas down in Gaza, and all these different Islamic groups would be more than willing to jump in and help Russia defeat Israel. But, these bordering nations are just silent. So, something happens beforehand to give Israel peace. The peace could come about because once Israel subjugates the nations surrounding them, they would now be dwelling in peace and safety. A victorious Israel would think nobody would dare attack them. So, they are unsuspecting of another attack, like this verse says. Nathan Jones: Though Israel believes it's at peace, Russia will lead a coalition against Israel. Unfortunately, that is the case. Russia will lead a coalition against Israel as we can read in Ezekiel 38:15, "Then you will come from your place out of the far north..." That's as far north as you can get. Directly far north of Jerusalem is Moscow, so it again is pretty clear that we are talking about Russia. Verse 15-16 continues, "You and many peoples with you, all of them riding on horses, a great company and a mighty army. You will come up against My people Israel like a cloud, to cover the land. It will be in the latter days," the end times, "that I will bring you against My land, so that the nations may know Me, when I am hallowed in you, O Gog, before their eyes. Thus says the Lord God: 'Are you he of whom I have spoken in former days by My servants the prophets of Israel, who prophesied for years in those days that I would bring you against them?'" We are now at the end of this section concerning what God is saying to Gog. To paraphrase what God's saying, "I am going to bring you down, Gog. You think you are attacking Israel on your own? No, I put the idea in your mind. I'm going to drag you down and I'm going to beat you, and then the people will now that I am God." God then makes an interesting statement. To paraphrase, "I've been talking about this all the way back since the times of the prophets like Joel and the other prophets, now over 2,500 plus years ago." The result is that the world will know that this prophecy came true and know that God does live and He does rule. Vic Batista: That is almost exactly what Nebuchadnezzar had to come to understand. He had to learn the hard way that God rules. Often man thinks that they are in control, but that is an illusion, right? Nathan Jones: Exactly. Psalm 2 states that the nations plot in vain, but God laughs. He laughs. We think we are so tough with our nuclear bombs and our armies, but those are nothing compared to God's power. If Satan and all his angelic armies can't take God down, why do we think with our tanks and our machine guns we can prevail against God? Vic Batista: Absolutely! All God is going to say as recorded in Revelation 14 at the end is it's over. Nathan Jones: Yes, that's true. We are talking about a different war there called Armageddon. When Jesus returns to this earth and He fights the Antichrist who is the one-world ruler and all the armies of the world, Jesus doesn't have to fire a shot. He doesn't need His angels fighting people. We who are the Church, we will be following Jesus, but we won't be throwing any karate attacks or brandishing swords. Victory will come though Jesus speaking. Vic Batista: So, Nathan, I won't get to use my smooth fighting moves? Nathan Jones: No, Vic, sorry. Even with all your mad skills, you're just going to be a watcher. Jesus alone wins the war. Most people over the last 100 years have feared Russia and her armies. They fear Iran now as it tries to build nuclear weapons. The Gog-Magog coalition is going to have a huge army. Little Israel with only a few million people will have to deal with millions of enemies coming down to attack them. The rest of the world will have no interest in defending them. You can see a picture can't you? God is trying to get Israel to depend on Him and Him alone. Vic Batista: Yes, absolutely! Isn't that the same thing God wants from every person, whether we currently have a relationship with the Lord or not. For those who don't have a relationship with the Lord, you need to understand that Jesus Christ is the only hope. We need to depend and trust in Him, because things are not going to get any easier. Some people think that we are American and we can depend on our might and power, but America is changing for the worse. Only God can help us, and that's only through a relationship with Jesus Christ. Jesus needs to be our source. Right, Nathan? Nathan Jones: Exactly. God doesn't just provide salvation nationally. He does so personally. Jesus kicks out all the supports under our lives. He allows trials and tribulations to come into our lives when we are not in a right relationship with Him. In doing so, Jesus is saying, "Come back to Me. Trust in me and Me alone. Give your heart and life to Me and I will be your defender. I will be your Savior. I will be the lover of your soul." Vic Batista: Nathan, how would you encourage someone who doesn't have a relationship Jesus Christ. Can you tell them how they can begin a relationship even right now? Nathan Jones: All you have to do is pray from their heart, something like, "Dear Jesus, please forgive me of my sins and be my Savior." Jesus then promises to forgive you of your wrongs that you have committed. He has promised to forgive you of your rebellion against Him. He promises to give you a new life, a new hope, and eternal life with Him in Heaven forever. That promise Jesus made is an amazing, amazing thing, because do you know what? To fulfill that promise, God had to send His Son Jesus Christ to die in your place for your sins. This gift is free for you, but it cost God everything He held dear. Vic Batista: I'd like to encourage people to know that Jesus is coming soon. He is the only hope for the world. Salvation is only found in Jesus Christ. There is no other way. We want to encourage you to trust in the Lord. In the tenth segment of our study of the Gog & Magog War of Ezekiel 38-39, Vic and I will continue our study of the events of Ezekiel 38-39.